They say that the flame that burns twice as bright burns half as long, but CSI: Cyber wasn’t a flame. It was a little LED light, shining through the darkness like a notification on your phone telling you that a loved one sent you an email, that an old friend wants to reconnect on Facebook, or that someone you follow on Twitter recently mentioned CSI: Cyber. But now, after two seasons of techno crimes and virtual violence, that little light has blinked off for the last time and CSI: Cyber has officially been canceled. 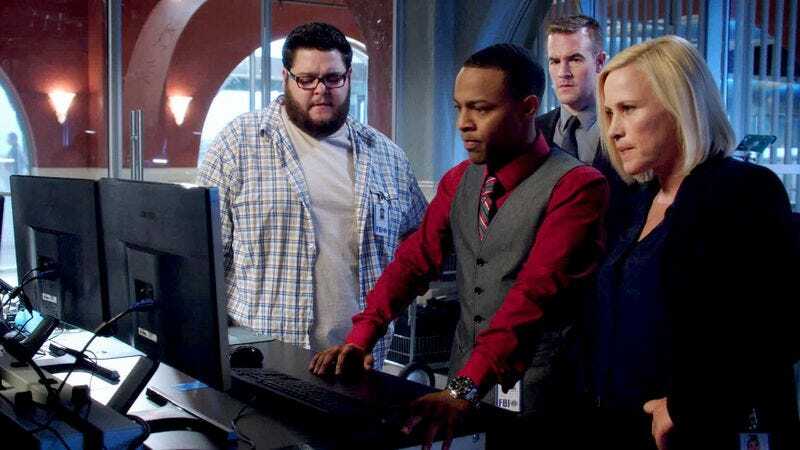 For anyone who missed out on TV’s preeminent computer-related crime scene investigation procedural, CSI: Cyber starred Patricia Arquette, Ted Danson, and James Van Der Beek as members of an elite law enforcement team tasked with keeping the internet (or “net”) safe from hackers, trolls, griefers, team killers, spawn campers, and just all-around noobs. Also, Van Der Beek’s character was named Agent Elijah Mundo, which was the best name in TV history. This sad news comes from Variety, which says CSI: Cyber never managed to reach the high ratings bar set by the other CSI shows, leaving CBS to frequently dump it on Sunday nights (the day when people often watch other, better shows). Also, CSI: Cyber was the final CSI show still on the air, so with its death also comes the death of the CSI franchise itself. Thankfully, though, it will live on forever in syndication and on Hulu.